See, I already knew that the PF Chang’s story wasn’t right since I’ve been making this particular version at home long before PF Chang’s started up in 1993. Maybe he’s the one that came up with the sticky sweet version of Mongolian Beef and while I gotta say PF Chang’s Mongolian Beef is crave-worthy (and at $18.50 a plate, it better be) but I just can’t eat like that very often! So my homemade version of Mongolian Beef isn’t a PF Chang’s Mongolian Beef at all. It’s far more savory, full of gingery flavor accented by five-spice powder. If you haven’t used five-spice powder, you can buy it or make it but either way be careful with it. It’s a strong spice blend made of (usually) star anise, clove, cinnamon, Sichuan pepper, and fennel seeds. The only sweetness at all in this dish comes from a touch of sherry; there’s no added sugar. If you are used to the sweeter version of Mongolian Beef and when you taste this, it just doesn’t set right, try stirring in just a touch of sugar, white or brown. The beef, which can be flank steak (it can be pricey) or sirloin or just about any steak or roast thinly sliced is marinated for 30 minutes or up to four hours, so Lighter Mongolian Beef is pretty doable, even on a weeknight, especially if your beef is prepped ahead. I actually made this Lighter Mongolian Beef awhile back. I bought a roast and used most of it for my Poor Man’s Mock Prime Rib, but since the roast was larger than I needed, I cut it down. Part of it went to make my Vietnamese Beef & Potatoes and the rest to this recipe. When it’s time to cook, your Lighter Mongolian Beef literally takes minutes, so have your rice or noodles already started along with any veggies you’re serving. Lighter Mongolian Beef is great with one of the packages of Stir Fried Veggies, although my fave veggie to serve Lighter Mongolian Beef has got to be, hands down, my Simply Steamed Broccoli. My poor cherry tomato plant – With my hand & shoulder so bad I couldn’t water it! As I mentioned, you can make Lighter Mongolian Beef with just about any beef. Put your beef in the freezer and leave it for about 20 minutes and the firmer beef will be much easier to slice thinly. Make sure to slice across the grain and you can slice in strips or in thin pieces that are almost shaved off the beef, it really doesn’t matter. Do what you find easier. If my beef is thick, say more than an inch and a half, I slice through it horizontally, first, which will give me two thinner sections to cut through. If you’re using a tougher cut of meat, you don’t want to cook the heck out of it which will only make it tougher. Try to just stir-fry until the outside has a bit of color but the inside is still pink. It will cook more after the sauce is added. If you don’t have five-spice powder and don’t have an array of recipes made with it, you might not want to buy it. Try adding just a pinch of clove and a bit of whatever spices in the five spice powder you do have. A little white pepper can stand in for the Sichuan pepper, and if you don’t have white pepper just use black. Because I want to tinker around with making a roast, I just picked up a sales priced one that was a bit larger than I needed. Then I sliced the beef for my Vietnamese Beef & Potatoes Bo Xao Khoai Tay and Lighter Mongolian Beef off the edge of the meat before I made my Poor Man’s Mock Prime Rib. It’s actually a great strategy to take one pricier item and stretch it across more than one meal. I usually do that by cooking with leftovers (like the Steak & Mushroom Pie made with beef leftover from the Poor Man’s Mock Prime Rib), but in this case, I did that division up front. Look for beef to be at a low in the fall and around any holiday when beef is often the star, like Christmas, New Years or Valentine’s day. You’ll find the pricier cuts on sale and usually find the cheaper cuts at a low, often the following week. There’s only so many Filets and Rib Eyes and something has to be done with the lesser cuts so they get priced to move. Stock up your freezer! Mix all of the ingredients except the steak in a large bowl. Add the steak, toss and turn to coat. Refrigerate for at least 30 minutes and up to four hours. Heat oil in a large skillet over high heat. When hot, add beef and the white parts of the green onion, cooking quickly to sear beef and stirring often. Do not overcook; remove from the pan when the beef is still slightly pink in the center. While beef is cooking, add cornstarch to the bottom of a large cut; a 2 cup pyrex measuring cup works well. Add a little bit of soy sauce, stirring into a paste, then add more, stirring to avoid clumps. When smooth stir in the water, Sherry and hoisin. Add the mixture to the hot pan, stirring with a whisk and boil until desired thickness is reached. Add beef and any juices back to the pan along with the green parts of the green onions and simmer briefly. I’ll be sharing my Lighter Mongolian Beef at Fiesta Friday #252, and the co-hosts this week are Alex @ Turks Who Eat and Zeba @ Food For The Soul. Stop by and check out Fiesta Friday and Alex and Zeba’s sites; you’ll love them all! This entry was posted in Click here for Bargain Meals, Click here for Fabulous Food Posts and tagged Asian, Beef, Green Onion, taiwanese. Bookmark the permalink. Thank you for this recipe! I order whole beef tenderloins from New Zealand, grass fed and all, cause that’s all my husband will eat, and after cutting the filets, I always have to figure out what to do with the tips. Obviously since it’s tenderloin, I can’t use it in a stew-type dish that typically cooks for 8 hours. Often times it’s a stir fry, but this is something I don’t make, and my husband would love. The tenderloin would be a perfect choice!!! Oh my gosh is that your Christmas dinner, Mimi? It sounds like heaven! No. Just a regular meal for my husband. He’s quite spoiled. Love this simple and flavorful dish Mollie. My family would love this and it makes for a perfect weeknight dinner if the beef has been marinated and refrigerated in advance. Thanks for sharing. Thanks Zeba. Prep ahead used to always be a thing when I had kids. We’d get home and the kids would just about be dying of hunger! No I usually don’t but this happened to be in a pot and was covered in tomatoes when the frost hit! It was so heavy, but luckily a neighbor spotted me lugging that thing in and gave a hand. I was surprised it stayed alive as long as if did. This was seriously a magic plant! Oh and usually I just bring my herbs in, the ones I’m not drying, anyway. This recipe looks fantastic! I never make this type of food at home – always ordering it (which gets too pricey)! 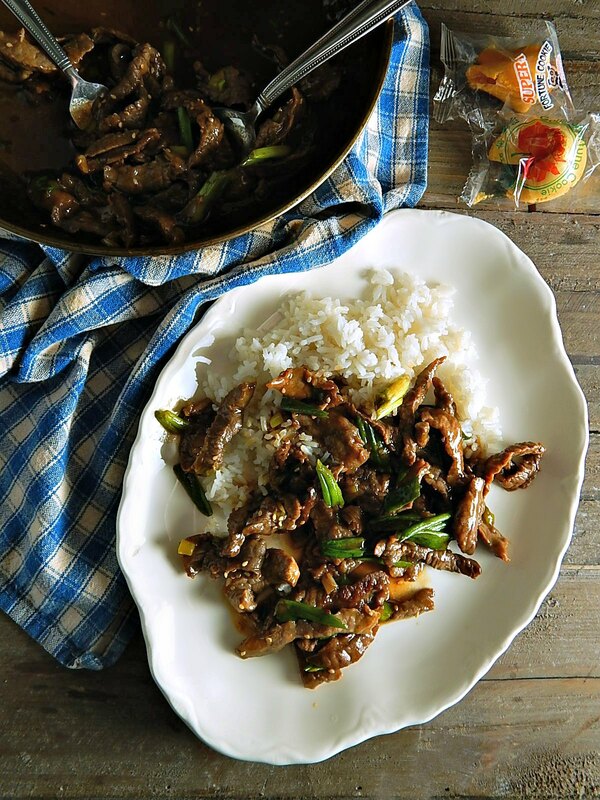 My husband loves Mongolian beef, so will definitely try this one. YUM! Good to hear! I hope he likes it but fyi, if he loves the takeout version, he might want a little sugar! No pun intended, lol! Hi Ellen, thanks. I made it awhile back but just putting the pics on the post made me hungry for it again!! At first he was getting glassfuls but then even that was too much. And the poor thing was STILL valiantly trying to give me tomatoes! I’m on the mend now, though. Aww..the gift that keeps on giving! Glad you’re feeling better! Hi Sebby, thanks! I feel like a killer, now!